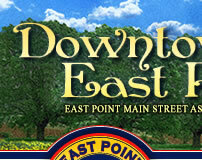 This “convenient point” became the City of East Point. 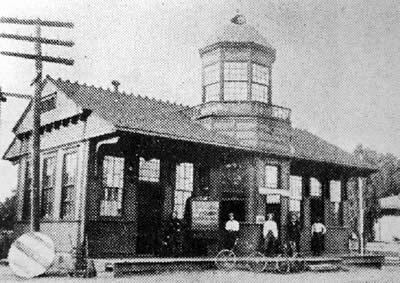 The trains not only delivered goods to and from the many businesses that sprang up along the railroad, but they delivered passengers and the U.S. mail as well. Prior tothe construction of MARTA, West Cleveland Ave. crossed directly over the railroad tracks (becoming E. Cleveland Ave.). If you stand on the pedestrian bridge facing north, you can look down and see the remains of the asphalt road. Looking in the same direction, you will see where the two railways split-- Atlanta & West Point to your left and the Central of Georgia to your right. Between this split, on the north side of East Cleveland Ave., was the Central of Georgia passenger depot (see photo). 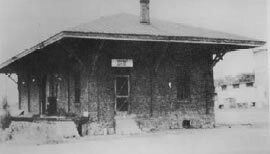 Across the tracks to the east of this depot was the Central of Georgia freight depot (see photo). 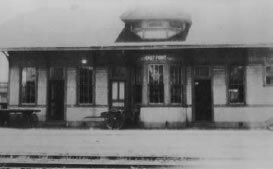 The Atlanta & West Point passenger depot (see photo) was located south of the pedestrian bridge between the tracks facing west (or Main Street). These three buildings are no longer standing; however, the City of East Point continues to be a hub of transportation. Through many mergers over the years, the Atlanta & West Point has been incorporated into the CSX Transportation network and the Central of Georgia is now part of the Norfolk Southern Corporation. These tracks led East Point straight into the future by allowing us to be located directly on the MARTA rail line as well as convenient to Hartsfield-Jackson Atlanta International Airport.